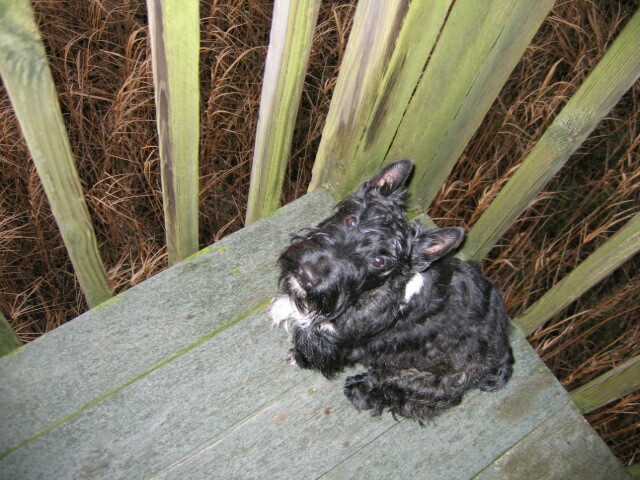 This entry was posted in The Scottie Chronicles and tagged dogs, pets, photography, Scottie photos, Scottie puppies, Scotties, The Scottie Chronicles. Bookmark the permalink. You got busted for something and are remaining silent? You do have a guilty face in this one. Dang – your grass is high – there could be nelliefumps hiding in there ! Who ever took that picture of you sure is a tall one!!! You look like you just got in to trouble for something…takes one to know one I guess…that’s the look on my face when I’m in trouble!!!! Our ‘SILENT SUNDAY’ was spent cuddled w/ our clan mom in the big bed~~~THUNDER & LIGHTENING and LOTS o RAIN. When cleared we walked and saw a “firefly” at the mansion !! Wish you could have been with us Stewart !!! That looks like my classic “who me?? ?” look, Stuart. BOL! You look a little caged in Stuart! !